^ Mechanical properties of materials. Kaye and Laby Tables of Physical and Chemical Constants. National Physical Laboratory. [2008-03-06]. ^ Cereal box health warning after recycled cardboard study. The Daily Telegraph (London). 2011-03-08. ^ Agents Classified by the IARC Monographs (PDF). New York Times. [31 May 2011]. ^ Barbara Ingham. Care and Cleaning of Butcher Blocks and Wooden Cutting Boards (PDF). Food Safety & Health. University of Wisconsin–Madison. October 2007 [2009-07-12]. 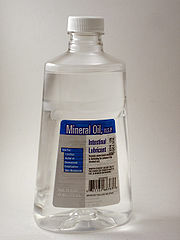 ^ Mineral Oil Liquid Facts and Comparisons. Wolters Kluwer Health – A to Z Drugs Facts. Drugs.com. 2009-06-03 [2009-07-13].